The Microburst System delivers power, performance and flexibility. 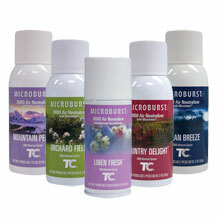 The best overall economic choice in aerosol dispensers, Microburst is also more environmentally friendly than standard aerosols. The patented actuator distributes the finest mist and provides greater coverage with less propellants.